2011 is here and The Grants are going on Radio. We are going to be on CJBK 1290 or you can listen live at www.cjbk.com. 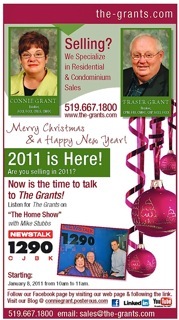 If you have any Real Estate questions either call The Grants @ 519-667-1800 or email sales@the-grants.com.
" LIFE IS A GIFT -- RIDE LIKE YOU STOLE IT! "